The councillor behind the motion said it doesn’t mean drivers will be fired. DUBLIN CITY COUNCIL’S transport committee has passed a motion calling for new Luas trams to be automated. Fine Gael councillor Dr Paddy Smyth proposed the motion, which states: “This committee calls on the new Minister for Transport, the National Transport Authority, Transport Infrastructure Ireland and Transdev to ‘future proof’ all new Luas rolling stock so that it is capable of being fitted with self-driving software. The vote on the motion was held earlier today. Smyth said its passing “does not mean any drivers will be fired from their job and replaced by an automaton”. However, he said it was one of the options that should be looked at in case further Luas strikes take place. The long-running industrial dispute between workers and management ended earlier this month after they both backed a Labour Court recommendation for pay increases of up to 18.3% over the next four years. In fact, I doubt there is a single person in this chamber who believes that in 50 years time humans will be driving these trams. The only thing industrial disputes of this nature achieve is to hasten the inevitable automation of these services. For proposing this motion I have being accused of being a strikebreaker, roundly admonished in the media for ‘fanning the flames’ of industrial dispute and, that as a city councillor, I should stay out of a dispute between a private company and its workers who are exercising a legitimate right to withdraw their labour. TheJournal.ie has contacted Siptu, the union representing drivers, and the Department of Transport for comment. Transdev, the company that operates the Luas service, told us they won’t be commenting. Email “Dublin City Council backs call for new Luas trams to be automated ”. 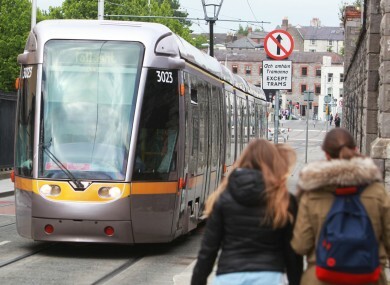 Feedback on “Dublin City Council backs call for new Luas trams to be automated ”.